Report #: 17-MSP-013150 On Wednesday, March 29th, 2017 at approximately 8:45 pm, Bel Air Barrack troopers responded to the area of 1401 Pulaski Highway, Edgewood for a Robbery. The subject depicted on this flyer has been determined to be a person of interest. 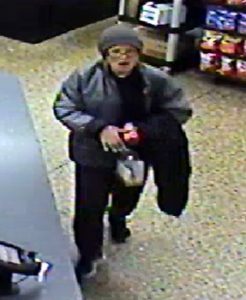 MSP Criminal Enforcement Division Northern Region is seeking assistance in identifying this person.